Wedding is the most grand and auspicious ceremony for every Indian. A typical Indian wedding lasts for almost a week with preparations starting from almost a year back. For Hindus, wedding is a sacred affair and can be solemnized only in the presence of a priest. Well they say, marriages and made in heaven, but you have to pay its bill here on earth (LOLs). It is estimated that an average of 1crore (10 million) weddings happen every year. The kind of wedding party people thrown in India reflects the wealth, family status and pride of the family. When I came across the annual wedding budget of Indians, I went literally numb. 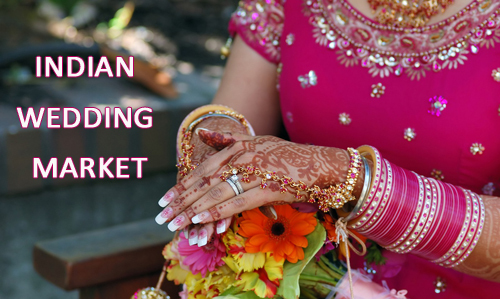 The Indian wedding market size worth Rs 19,0000 crore (1.9 Trillion) , which will be higher than the annual budget of small African countries. I am not exaggerating; this is the actual round up figure. However, the market is seen to be growing at a constant pace of 20-30% per year. It is estimated that with the expansion of middle income class and the improved per capita income, the figure will be multiplied. On an average an Indian family will spend around Rs 10 lakhs (1 million) to Rs 70 lakhs or more (7million or more) per wedding. Wedding loans and Wedding Insurance are also available in the market today. There are again multiple sub sectors of which most of them are not accessible because of the brand image of competitors and high capital intensiveness. a) Floral Designs: You can start a small business as a good floral designer without much investment in innovative theme based wedding and style. b) Decorations: You can always start an organized decoration firm with the perfect designs available online. c) Wedding cards: Collaborate with the printing industry and develop design oriented cards at a minimal cost and start your business as a wedding card developer. d) Catering: If you are interested in the food industry, catering business will be ideal too. e) Event management: With a good connection with good organizers you can run an event management firm. f) Honeymoon packages: Another good idea will be to start an enterprise with theme wedding and honeymoon packages added to it. Be an entrepreneur and organized memorable tours. g) Bridal make over: If you love the beauty market, enter the field by providing free tips and quality services.